Communications Campaign Best Practices brings together information that can be used by lesbian, gay, bisexual and transgender (LGBT) social justice advocacy organizations to get their message out in the media. This 61-page document includes sections on setting campaign objectives, identifying a target audience, messaging and creative development, qualitative and quantitative market research, media planning, getting media coverage, the basics of media relations, integrating acts of protest, identifying effective spokespeople, setting a budget, campaign evaluation, and more. Movement Advancement Project and GLAAD. January 2008. 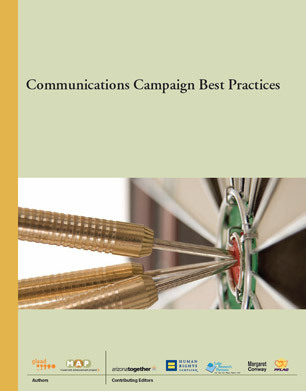 Communications Campaign Best Practices. http://www.lgbtmap.org/communications-campaign-best-practices (date of access).